The Meteora jacket and the Aviator Diesel capri pants go perfectly together to form one cohesive dieselpunk look, but they are sold as separates in case you want to mix and match them with other items. Both the jacket and the pants have strong accent lines in bold gem tones, creating a pseudo-militaristic vibe to the look. This is a look that can easily be a smart and fashionable uniform of any imaginary order or simply strong no-nonsense outfit for stomping around the grid with. Both the jacket and the pants come with a colour change HUD that includes eight different accent colours in it, so you get several pairs in one purchase! These are rigged mesh items that move with your avatar. The jacket comes in seven sizes: in addition to the five standard sizes there are also two additional ones: XS+ that provides more generous curves in the top part of base XS and M+ that has more muscles and extra curves than base M. The capri pants come in the five standard sizes and the fitmesh version. Please try the demos. Originally released at A Clockwork Spiral 2014, both the jacket and the pants are now available in the main store and the Marketplace. Permissions are M/C/NT. Price L295 per either jacket or pants. A Time Before is a vintage inspired gown that combines several enticing elements in it. 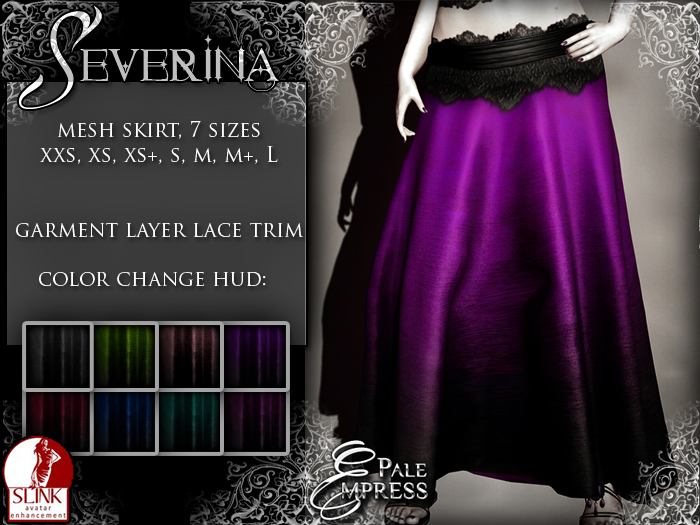 The deco styled fabric of the skirt is partially covered by delightfully gothic skull patterned brocade, held together by a row of feminine ribbons in the back. The corset top surprises with its adventurous leather strap lacing. The whole forms a uniquely bold statement of a gown, ready to stun the crowd wherever you choose to stride. 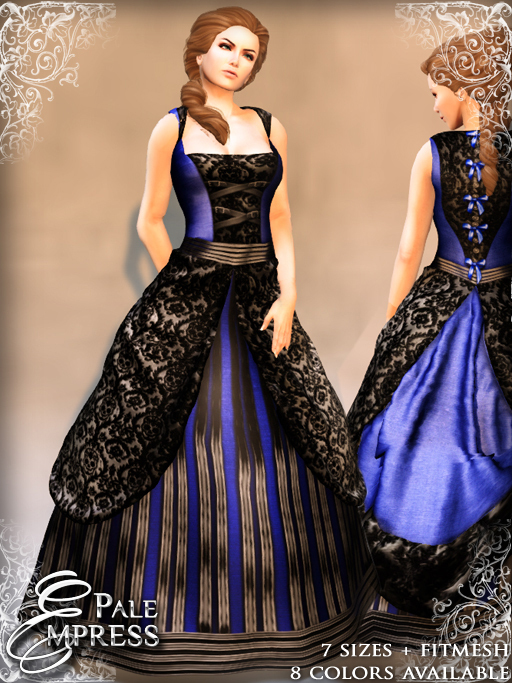 The gown is rigged mesh that moves with your avatar. In addition to the five standard sizes there are also two additional ones: XS+ that provides more generous curves in the top part of base XS and M+ that has more muscles and extra curves than base M. On top of our seven sizes there is also a fitmesh version included. Please try the demo. 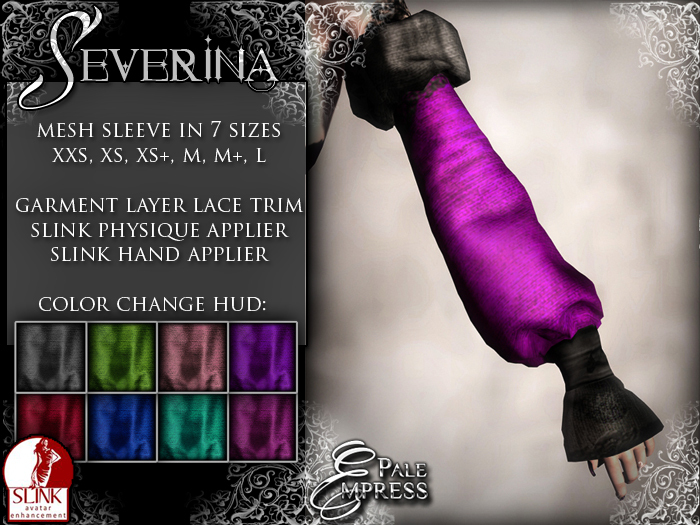 Originally released at A Clockwork Spiral 2014, now available both in main store and the Marketplace. Permissions are M/C/NT. Price L295 per gown, eight colours available, L1180 for the fatpack. Separate colours available only in the main store, only fatpack on the Marketplace.